2.1 Objective and subjective time? Have you ever wished that you could turn back time and change something you said or did? Most of us have. Many stories portray the idea of time travel but, of course, time is out of human control. We are physically unable to alter the course of time, what if we could control the way we perceive time? And how does the way we perceive time affect our personal relationships? This chapter considers our psychological perspective of time and the impact that our time perspectives can have on our personal and social relationships. The chapter also considers whether we can change our understanding of the way we and others perceive time with a view to improving our personal relationships. Time perspective (TP) refers to the often unconscious, psychological process of conceptualising time in order for human beings to function and make sense of life events (Zimbardo & Boyd, 1999). It is thought that humans create mental temporal categories which help to process day-to-day life experiences which, in turn, influence thoughts, feelings and behaviours (Keough, Zimbardo, & Boyd, 1999). Time perspective theory suggests that humans give meaning to their everyday life events by psychologically categorising human experience into three distinct temporal perspectives: past, present and future (Zimbardo, Keough, & Boyd, 1997). Sacket and colleagues (2010) conducted an experiment where they exposed individuals to a selection of songs for ten minutes. One group was told the period of time that had passed was five minutes and the other group was told the period was twenty minutes. The group that were told five minutes had passed enjoyed the music significantly more than the other group. The twenty minute group felt the time had "dragged on". This manipulation of subjective time proved to be the difference to whether the situation had been enjoyable or not. Lewin's model described TP as the sum of an individual's psychological evaluation of the past and future at any given moment (1951). In other words, an individual's behaviour in the present moment is influenced by their perceptions of past experiences and their anticipation of future events. For example, a student considering asking a question in class might recall a similar situation in the past in which they asked a question. Depending on whether the feedback the student received was positive or negative would partly determine whether they would ask the question or not. The student may also evaluate the future and consider whether the question is appropriate and relevant, potentially leading to feelings of competence, or whether the question might be inappropriate or irrelevant which could lead to embarrassment. According to time perspective theory, a combination of past and future evaluations (which differ for each individual), determines our behaviour in the present moment, in this example, asking the question or not. The Zimbardo Time Perspective Inventory (ZTPI) is a standardised measure of individuals' TP. The ZTPI is a 56-item self-report questionnaire which attempts to measure the extent to which an individual perceives time through five perspectives (Zimbardo & Boyd, 1999). The past is divided into two perspectives: positive and negative. The present is divided into two perspectives: hedonistic and fatalistic. The fifth perspective is future. Past-negative - Individuals with a past-negative TP tend to focus on negative memories from the past, generally have a negative view of life and often find it difficult living in the present. Past-negative TP is associated with Post Traumatic Stress Disorder (PTSD), depression and a low quality of life. Past-positive - Individuals with a past-positive TP have warm, happy and positive attitudes to past experiences and memories. These individuals are often associated with high levels of self-esteem and happiness and are considered to have a healthy outlook on life. Present-fatalistic - Individuals with present-fatalistic TP do not believe they are responsible for the outcome of their lives and believe their future if predetermined by fate. These individuals are associated with depression and anti-social behaviour and generally have a negative outlook. Present-hedonistic - Individuals with a present-hedonistic TP are driven by enjoyment and excitement and don't look far into the future to get their rewards. They are often associated with pleasure seeking and risky behaviours and score low on scales of conscientiousness, consistency and impulse control. Future - Individuals with a future TP are forward thinkers and plan ahead. They are reward driven and often delay immediate gratification for larger future rewards. Future TP is associated with high academic achievement, well-being and impulse control. 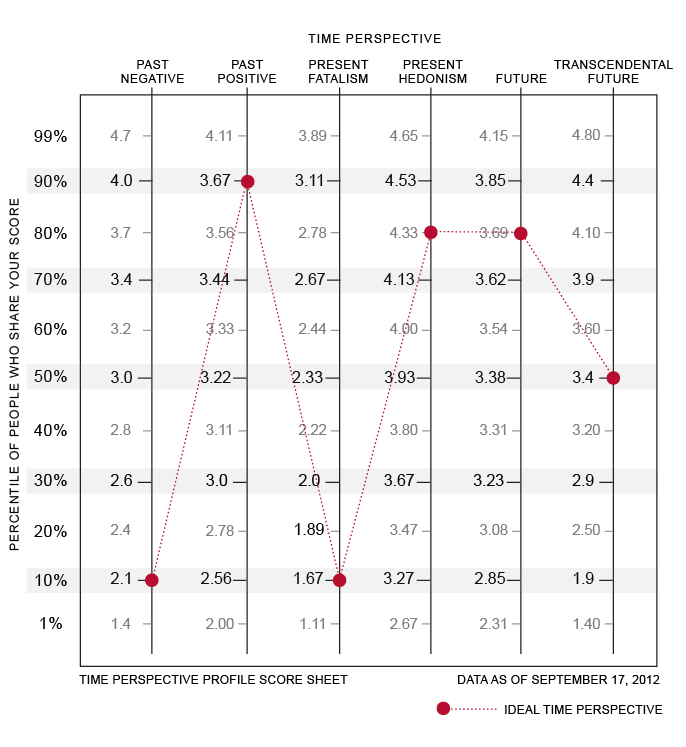 It is important to note that individuals do not necessarily fall into any one of the TPs, but rather each perspective acts as a conceptual continuum by which an overall composite score can be calculated to indicate to what extent an individual perceives their life events, which in turn, stands to impact cognitions, emotions and behaviour (Zimbardo & Boyd, 2008). Mostly, an individual will have a dominant perspective, but often individuals have high scores in more than one perspective. For example, individuals with high Past-positive scores often have high future orientations. Similarly, individuals with high Present-fatalistic scores often score highly on Past-negative (Zimbardo & Boyd, 1999). Zimbardo and Boyd suggest that the optimal TP profile is high Past-positive, moderate Present-hedonistic, moderate Future, low Past-negative and low Present-fatalistic. Complete the ZTPI and compare your score to the 'optimal TP’. Past-negative A focus on negative aspects, feelings and memories from the past "I think about the bad things that have happened to me in the past"
Past-positive A focus on warm positive feelings and memories from the past "It gives me pleasure to think about the past"
Present-hedonistic A focus on risk taking and impulsivity, living life in the present "Taking risks keeps my life from becoming boring"
Present-fatalistic A defeatist and hopeless view of life, often associated with depression "My life path is controlled by forces I cannot influence"
Future A focus on future orientation, planning and setting goals "I am able to resist temptations when I know there is work to be done"
TP influences a range of human behaviours and social outcomes such as risky driving (Zimbardo, Keough, & Boyd, 1997), procrastination in the workplace (Gupta, Hershey, & Gaur, 2012) and substance use (Keough, Zimbardo, & Boyd, 1999). Research investigating the effects of TP on personal relationships, however, is relatively limited considering the seemingly strong influence the way individuals perceive time impacts on the way they seek and maintain personal relationships. Relationships and time are closely related. Whether a romantic partner, friend, colleague, client, family member or acquaintance, there is arguably a beginning point in all personal relationships where there is no shared past and both parties are primarily focussed on the present (Zimbardo & Boyd, 2008). As the relationship develops, the shared past grows and individuals begin to form expectations of what the future holds. As such, it stands to reason that new attitudes towards time develop. If every personal relationship, whether a brief encounter or long lasting partnership, has a past, a present and a future, then the way individuals perceive time is likely to be a significant factor in the satisfaction, commitment, quality and longevity of personal relationships. Nuttin (1985) argued that individuals with a future TP are more likely to succeed in life than individuals with a present TP as they are associated with higher levels of education, higher income and a healthier outlook on life. Similarly, in a study exploring the associations between the five TPs from the ZTPI and social relationships, Holman and Zimbardo found that future oriented individuals were most likely to receive social support from family and close friends and reported more meaningful relationships with significant others (2009). In contrast, Oner suggests that future oriented individuals are less likely to be satisfied in their relationships as they are more selective, more cautious and have higher expectations of the future of their relationships (2000). Oner found that relationship satisfaction was highest in individuals with a present temporal perspective. This is an interesting finding as research suggests that present focussed individuals lack emotional stability and are less likely to develop meaningful relationships (Zimbardo & Boyd, 1999). This could be explained by present minded individuals exerting more effort in their relationships in the present moment and therefore reporting higher satisfaction at any given time. However, this study fails to indicate the length of relationships of the participants. For example, present minded individuals, although reporting higher relationship satisfaction at the time of the study, might not be as committed to the relationship as their future minded counterparts. If this were the case it is likely that relationships between present minded individuals would not last as long, consistent with much of the research on present minded people (Stolarski et al., 2016). Further, future minded individuals might be in the process of developing a more meaningful long-term relationship and may be more satisfied over a longer period of time. In another study, Oner found that individuals who reported relationship dissatisfaction were more likely to score higher on future TP than those who were satisfied with their relationships (2001). While again, on face value this might seem counterintuitive, it might be that individuals who are future focussed are more likely to stay in relationships that they are not happy in. It makes sense that the more future focussed an individual is, the more pressure they might put on themselves to make their relationships work regardless of whether they are satisfied or not. While the findings of these studies are interesting, it is the fundamental concept of present minded individuals that they are happier and more satisfied in the present moment and do not project far into the future for gratification. Conversely, future minded individuals are more concerned about future commitment levels in their relationships and therefore would be less likely to report that they are happy and satisfied in the present moment. Therefore, it could be argued that to gain an understanding of the effect of TP on our relationships, a longitudinal study design would be needed to more accurately measure the relationship satisfaction of future minded people. Ella-Louise and Fernando met on holiday 12 months ago and have been inseparable ever since. They decided to move in together and have been renting an apartment for 6 months. Ella-Louise is already planning for the future with Fernando, has started saving for a deposit on a house and wants to get married and have children. Fernando loves his life with Ella-Louise but wants to spend the money he has saved on a holiday - he feels they deserve it after working so hard. He doesn’t want to commit to a wedding or start talking about potential baby names. Cracks start to appear in the relationship. Fernando feels he is being pressured, buying a house is something people do years after meeting and he doesn’t want to miss out on his holiday. Ella-Louise feels Fernando is not committed to the relationship and going on holiday would be a waste of their money as there are much more important things to plan for. After a while, they start disagreeing over smaller things and the conflict intensifies. If Ella-Louise and Fernando became aware that their disagreements were stemming from differing TPs, they could both make compromises. Fernando sees the world through a present focussed lens and therefore enjoying the present moment is important to him, whereas Ella-Louise is a future person so planning ahead is important to her. An equal effort of acknowledgement from both is likely to result in a happier present and future together. The example of Ella-Louise and Fernando highlights the concept of relationship conflict originating from a temporal imbalance. Zimbardo and Boyd (2008) argue that couples are often unaware that it is their differing TPs at the core of the problem. As the conflict intensifies, negative views and opinions can generalise to other aspects of the relationship and before long both parties can start to dislike each other. Knowledge and awareness of differing TPs are key to resolving relationship conflict. If mismatched TPs are acknowledged by both parties early on, compromises can be made to minimise the conflict in the present. According to Zimbardo and Boyd, this leads to a shared TP. Attachment theory (AT) has been found to be closely linked with time perspective, particularly in the context of personal relationships (Laghi et al., 2009). According to AT, the attachment individuals have with their caregivers in infancy will influence the development of childhood memories. An internal working model of one's elf is then formed (Bowlby, 1969). If the attachment is secure, an individual is likely to have positive childhood memories and anticipations of future happiness in their relationships. Insecure attachment, however, is related to negative memories of the past and negative expectations of future relationships. Not surprisingly, there is a strong association between secure attachment and relationship satisfaction. There is also a strong association between insecure attachment and relationship dissatisfaction (Laghi et al., 2009). It is suggested that an individual's TP is formed during adolescence, as this is the time when humans become physiologically capable of anticipating and expecting future scenarios (Mello & Worrell, 2015). It seems logical therefore, that a person's attachment type will predict whether they will develop a positive or negative temporal perspective. Holman and Zimbardo supported this idea when they reported that individuals with a Past-negative temporal perspective were less likely to have had close parental support and were associated with higher levels of relationship conflict with significant others (2009). However, it might be that attachment type is just one of many factors contributing to the way in which we perceive time. To investigate this further, it would be interesting to measure differences in TP among participants with secure attachment and separately measure differences in TP among participants with insecure attachment. Significant differences within each group would highlight variability independent of attachment type, potentially opening new areas of study to add to the growing body of TP literature. Socioemotional selectivity theory (SST) attempts to explain the role of time in an individual's pursuit of social goals and selection of social partners (Carstensen, Issacowitz, & Charles, 1999). The theory suggests that when a significant ending is perceived in an individual's future, they become more focussed on emotional social goals. The classic example of a significant ending is death, as such the theory suggests that as people get older and their time becomes more limited, they tend to change their TP to a more present based orientation. This change is associated with a shift from a pursuit of knowledge related social goals in earlier adulthood where the development of relationships has an emphasis on future reward, to a pursuit of emotionally meaningful goals in later adulthood where a stronger emphasis is placed on emotional support and warmth (Carstensen et al., 1999). Lang and Carstensen (2002) found support of SST in a study assessing social relationships across the lifespan. In a sample of participants ranging from 20 to 90 years old, they reported that older participants were more likely to pursue emotionally meaningful relationships than younger participants and, as such, in accordance with SST, reported higher relationship satisfaction. These findings offer further support to SST as a reliable framework for future TP and relationship research. However, there are limitations when applying SST in the context of the effects of TP on relationships. First, SST is a lifespan theory and does not account for differences in the effect of goal pursuit on social relationships between individuals of the same age. Second, SST is primarily focussed on future TP and does not account for past perspectives. This is an important limitation as past temporal perspectives have been found to significantly predict relationship satisfaction (Molinari et al., 2016). Third, individuals have been found to pursue social goals because they are naturally present minded and are not necessarily in the process of changing from a future perspective due to an impending significant ending (Holman & Zimbardo, 2009). Fourth, it has been suggested that the type of events leading up to feelings of a limited future might in themselves cause a desire to seek emotional relationships independent of psychological time. Finally, TP is a reliable predictor of social goal pursuit regardless of whether a significant ending is perceived (Holman & Zimbardo, 2009). A balanced time perspective (BTP) refers to the mental ability to change between temporal perspectives depending on situational demands (Zimbardo & Boyd, 1999). The ideal TP acts as an optimal conceptual pathway through each of the five ZTPI perspectives. This view assumes that an individual's TP remains relatively static over their lifetime, similar to a personality trait. However, the ideal pathway may not be as straightforward as first appears. For example, while Zimbardo and Boyd's 'ideal TP' includes high scores in Past-positive, research has also found that Past-positive individuals are less likely to be satisfied in their relationships (Mollinari et al., 2016). Similarly, people living in the present report the highest levels of relationship satisfaction, but for how long? And how well will an individual function in a long-term relationship without planning for the future? It has long been suggested that a positive view of the future is key to optimal functioning, but does it come at the expense of having fun in the present? "In an optimally balanced time perspective, the past, present, and future components blend and flexibly engage, depending on a situation’s demands and our needs and values"
The concept of BTP suggests that an individual's temporal perspective need not remain static over their life and may change depending on situational demands (Zimbardo & Boyd, 1999). The theory suggests that a BTP is the key to well-being as opposed to an over dominance of any perspective, which can become dysfunctional (Bonniwell et al., 2010). The theory places a higher emphasis on the dynamic nature of the constructs of TP and, in line with the constantly changing world we live in, a BTP enables us to better cope with the emotional, social and environmental demands of the situation (Bonniwell & Zimbardo, 2015). This seems particularly apt in the context of social relationships, as, regardless of which country or culture we belong to or come from, we are constantly meeting new people and as such, it is important that we are able to adapt in order to create and maintain meaningful personal relationships. However, some have questioned the validity of BTP due to varying definitions and measurements of its constructs (Zhang, Howell, & Stolarski, 2013). With the dynamic nature of flexibly changing between temporal categories depending on the situation, it is likely what constitutes a BTP for one person may differ from another. TP has been found to influence our cognitions, emotions and behaviour and subsequently, our relationships. Further, it is suggested that we are often unaware of such influences. The ZTPI offers a standardised measure of an individual's TP, however it seems to suggest that people are either past, present or future oriented. This appears to be a significant limitation in the context of personal relationships, as, for example, past-positive orientations have been associated with both positive and negative relationship satisfaction. The attachment type we develop in childhood and adolescence seems to provide a good indication of TP and in turn, relationship satisfaction, but with so many potentially confounding factors, the specific interaction between the three variables is not clear. SST offers a good framework for social relationships across the lifespan but only holds strong for future minded individuals. The idea of a BTP leading to higher levels of relationship satisfaction makes intuitive sense, however, difficulties in operationally defining the the underlying structure of what a BTP is suggests that it could vary between individuals. One thing that can be inferred from the literature on TP and relationships is that education and awareness as to the impact our temporal perspectives can have on our social relationships is a key first step in furthering our understanding and potentially, improving our relationship satisfaction in the future. Boniwell, I., & Zimbardo, P. G. (2015). Balancing time perspective in pursuit of optimal functioning. In Joseph, S. Positive psychology in practice: Promoting human flourishing in work, health, education, and everyday life. John Wiley & Sons. Bowlby, J. (1969). Attachment and loss v. 3 (Vol. 1). Random House. Furman, W., & Buhrmester, D.(2009). Methods and measures: The network of relationships inventory: Behavioral systems version. International Journal of Behavioral Development, 33, 470-478. Keough, K. A., Zimbardo, P. G., & Boyd, J. N. (1999). Who's smoking, drinking, and using drugs? Time perspective as a predictor of substance use. Basic and applied social psychology, 21(2), 149-164. Lewin, K. (1951) Field Theory in the Social Sciences: Selected Theoretical Papers. New York, NY: Harper. Nuttin, J. R. (1985). Future time perspective and motivation: Theory and research method. Hillsdale, NJ: Erlbaum. Zimbardo, P. G., & Boyd, J. N. (1999). Putting time in perspective: A valid, reliable individual-differences metric. Journal of Personality and Social Psychology, 77, 1271-1288. Zimbardo, P. G., Boyd, J. N. (2008). The Time Paradox: The New Psychology of Time That Will Change your Life. New York, NY: Free Press. This page was last edited on 31 May 2018, at 19:30.